When I got pregnant at the age of 43, my greatest fear was having a baby with Down syndrome. First, because I was an old first- time mom ; second, I had a sister with Down syndrome and lastly, my husband had a brother who was also Downs but died at a young age. So, when I had my first pelvic ultrasound at around four months, I could not contain my excitement ( coupled with fear ) and asked the doctor ( sonologist ), ” Are you able to see signs in there that my baby will be Downs or not? ” To my relief, he said, ” Yes, we do usually see a sign, and there is nothing in here. ” I could have hugged him then and there with the good news. At around 6-7 months of pregnancy, I had another ultrasound and aside from asking about the gender of my baby, I asked again the doctor ( my obstetrician ) about the possibility of my precious one having a defect or syndrome. And of course, when I finally had my son, I looked at him and seeing that he looked normal, I could not believe that this beautiful human being just came out of my body. He is already a pre-teen now and in middle school. New moms out there truly understand how it feels looking at and holding your baby for the first time. It’s the greatest feeling on earth! What are the signs that your baby has Down syndrome? These are crucial questions especially for first time moms. And would also include a mom who before birth knows that her baby would be having Down syndrome or another mom who has no knowledge but looking at her baby for the first time sees something odd about his appearance, or some moms who are not at all aware but the doctor tells them later that their baby has Down syndrome. I believe they would feel that their world is spinning or the other way around, they would gladly accept that this baby is God-sent and whatever he is, they will take care of him and nurture him no matter what. The outer corner of the eye will be turned up rather than down. The shape is also very similar to that of someone of Asian descent. This is usually the most noticeable physical feature of Down syndrome as your child grows up. Look at the upward slanting of Nathan’s eyes, isn’t he cute! Because of poor tone in the facial muscles, Down syndrome babies will not have much curve from the nose, cheeks or mouth. Their cheeks seem to hang on the face as well. This is noted when you look at the baby from the front wherein there is also not much shape to the cheeks. This is also very typical for babies with Down syndrome. New parents and families often ask “Why does my baby stick his tongue out?” This is either because of a small mouth, large tongue, or simply poor tone. Mark is Nathan’s cousin ; the genes definitely run in our family. 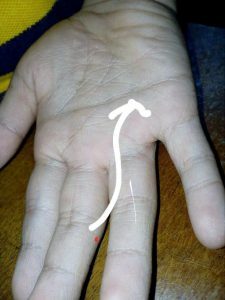 This single crease across the palm of the hand is seen in 45% of children with Down syndrome and is a result of hypotonia as the hand was not held in a tight fist while he was growing in the mother’s womb. That means 55% of kids with Down Syndrome do not have this, but if they have, it’s quite typical. Don’t get confused though, because some normal kids can also have a single palmar crease. A straight line goes from one side to the other side of the palm. Nathan can easily sit down with legs wide open. Look! Mark can fold his legs very cozily like a gymnast. A baby with Down syndrome always feels floppy or limp. When you hold him, it feels like he is going to slip through your hands or arms and if you lay him across your hand, he will look like a wet noodle. Growing up, they are so huggable because of this. This is also the reason why they may develop motor skills later than normal kids, thus, usually learn to turn over, sit up, or walk much later than usual. Their limbs become so flexible as they grow up. Pangga, my sister, had all those physical signs above, plus she had short stature ( also typical ) as well. What was very amusing as she was growing up was that she could pull her legs up to her face very easily even when she was sitting down. Growth and development- how delayed will they be compared to normal kids? Parents of babies with Down syndrome need to understand and accept that their angels will develop later than normal kids. They will definitely learn how to stand, walk and run but not as fast compared to other kids their age. Different kids develop at their own pace though, so one kid might walk at 2-3 years old, while others walk at around 3-4 already. Usually, they can walk on their own between 16 and 42 months with the average being 24 months. Cognitive learning skills likewise , as well as thinking, develop late and impairment ranges from mild to moderate. Again, Pangga learned how to talk and communicate but of course, was not able to sustain good conversations. Unluckily, she did not have any interventions like therapies because she grew up in a small town where these were not available. But she learned how to sing ( She had a beautiful voice ! ) just by listening over the radio and watching television or just hearing songs from other people. We used to live in a house just a few steps away from a church and even if she did not attend mass regularly, she learned to sing the mass hymns just by overhearing people sing them during Sunday masses. And boy, Pangga loved to sing that even in the middle of the night when everyone is asleep except her, she would sing at the top of her voice. When she sang and we would appreciate and clap our hands after her rendition, she would always giggle and have that captivating smile. What a joy to behold in our family! Congenital defects-will they have other illnesses at birth? 1. Heart defects – Almost 50% of these kids have congenital heart disease which can lead to high blood pressure in the lungs, thus the heart is unable to effectively and efficiently pump blood, and cyanosis (blue-tinted skin caused by reduced oxygen in the blood) develops. If severe, this could be a cause of death at an early age. 2. Vision problems – More than 60% of children with Down syndrome have vision problems, including cataracts (clouding of the eye lens) that may be present at birth. Other eye problems that could occur at birth include near-sightedness, “crossed” eyes, and rapid, involuntary eye movements. Pangga had near-sightedness and rapid, involuntary eye movements, the latter was the reason why one of her young nieces was scared of her and did not want to come close to her aunt. They need to be seen by an eye doctor as soon as possible to prescribe either glasses or surgery. 3. Hearing loss – About 70% to 75% of children with Down syndrome have some hearing loss, sometimes because of structural defect in their ears. They need to be screened at birth and have regular follow-up hearing exams. Later in life, or as these children grow up, some other health concerns may come up, such as infection, epilepsy ( seizure disorder ), usually developing for the first two years of life, gum disease and dental problems, disrupted sleep patterns and sleep disorders ( even obstructive sleep apnea ). Life expectancy- do they live until adulthood? Definitely they could live until adulthood. My sister, Pangga, lived until 46 years old. 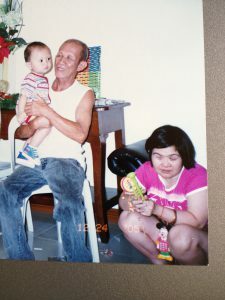 But because she reached only a mental age of around 5-6 years old, she was always considered the youngest in our family, even though she had four younger siblings. 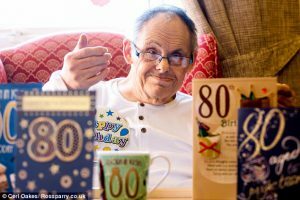 Mr Joe Sanderson from Cleveland, who was born in 1936, and is believed to be the oldest person with Down Syndrome, just turned 80 recently. Another guy, Kenny Cridge, from Britain turned 77 last month. 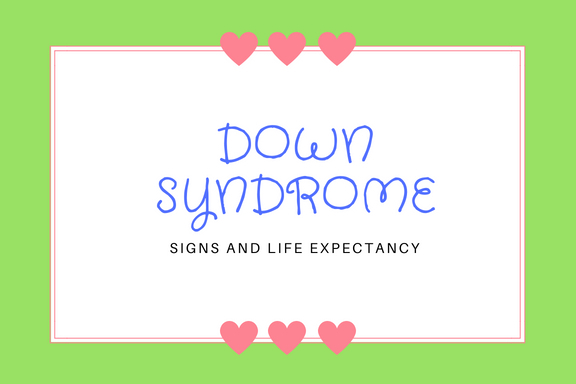 The life span of Down syndrome children, however, depends if they have concomitant illnesses, like congenital heart disease and other factors, like development of infections and other health concerns as they grow up. independently in a home or in an assisted independent arrangement, and a few even develop romantic relationships and even get married. 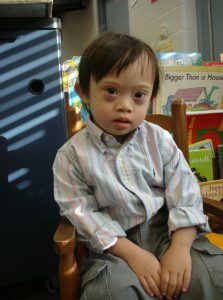 Many people with Down syndrome are also able to work or volunteer, thus, able to contribute to the progress of their communities where they live. In big countries like Canada, the government usually supports people with special needs starting when they are newborns, and even provide assistance for them later so they are able to live independently and have profitable income. 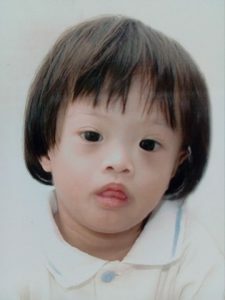 A family who is blessed with a child or children with special needs like Down syndrome, maybe overwhelmed at first, but with full support within the family and the community as a whole especially the government, these kids can grow up and become productive citizens . You may have learned of a couple from Australia who abandoned their baby with Down syndrome ( named Gammy ) and just got the normal baby ( they are twins ) born to a surrogate mother from Taiwan in 2013. 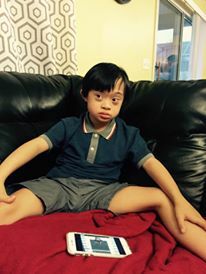 Gammy, born with a heart condition, is now 4 years old and lives with his surrogate mother in Bangkok. The family he is now with may not be related to him by blood, but they feel so blessed to have him in their midst. Truly, kids with special needs bring an immeasurable joy to everyone in the family and there may be lots of challenges raising them, but in the end the happiness that they bring in the household surpasses all these. Do you have a child with Down syndrome? How does your child bring joy to your family? Please share your stories with us. Your Article is very informative. My sympathy to you and your family of your loss to Pangga. I admire your charitable works in our country Philippines where people are family oriented. You have a good heart to people with special needs. True, they needs special care and attention from the society. The love that you share to them is immeasurable. With your family’s history of having Special kids, being inspired by them, I hope and pray that you have always the power to put in a good cause all your efforts towards Special People. You are a Woman of a good heart! Other than that,I enjoyed reading your article. It touches my heart and soul! All the best! Thank you for your good comments and your sympathy for our loss. I feel so blessed being here in Canada that I feel I really have to give back to the special kids in my hometown in the Philippines. I am giving my best to this website so I can spread awareness that kids with special needs are everywhere and like normal kids, they need our care and support. As well, I want to inspire more donors to help us with our present and future projects. Thank you for this informative and heartfelt post. The personal profiles you share remind me that we are not merely statistics but unique individuals full of potential and hope, and any possible physical and developmental challenges notwithstanding, we can all have a positive impact on those whom we come in contact with, directly and indirectly. Thanks so much for sharing! Yes, these special kids are there waiting for our love and care and they can definitely become adults like us, who can impact the society we live in. Thanks for your nice comments and for stopping by. I enjoyed reading your post, as it brings me back fond memories of my aunt who has Down Syndrome. Now i live further away but i continue to hear of her cheerfulness and lovely nature. When i was a teenager she would love to talk of boys XD and dance, she is amazing and im extremly happy that she was part of my childhood as i believe is thanks to her that i learned more of people with dissabilities and not have uncorroborated fears. I always try to inform people of the misconceptions there is around people with down syndrome. They are very smart and with lots of love and support they can achieve so much! So thank you deeply for sharing this info! Just like me, you are so lucky to have beautiful memories and experiences in your family, and for you having an aunt with Down syndrome. 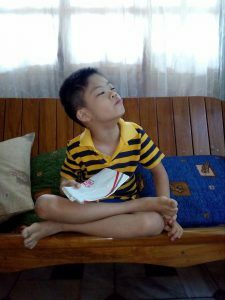 I’m unlucky though because my sister Pangga passed away already. As you said, people with Down Syndrome can be as smart as normal people if given the chance to be trained to be the best that they can be. And yes, they are always cheerful and so loving. Continue to have regular communication with your aunt, they have sharp minds, so she will always remember you.